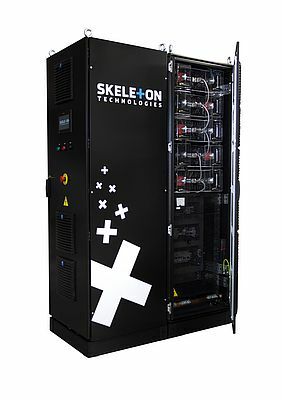 Skeleton Technologies provides rapid response power using ultracapacitors: a world first in the 100% renewable energy Scottish independent microgrid. SkelGrid, a fast response ultracapacitor energy storage, and uninterruptible power system, assists the Kinetic Traction flywheel as part of a demand response system to prevent Eigg’s microgrid from being totally dependent on the Lead-Acid backup battery solution in case of rapid electricity demand or supply changes. Lead-acid batteries suffer from whiplash effects and are sensitive to high depth of discharge, this reduces the array lifetime, increases array size, and it is the costliest part of the backup system to replace. The idea with the fast response units is to preserve the battery charge and avoid rapid charge-discharge cycles on the batteries. In other words, shaving the peaks and troughs of the power demand. The ultracapacitor solution brought by Skeleton Technologies' SkelGrid allows for the frontline fast response to take place before the flywheel is activated. This results in a much longer battery life as the power variations are taken care of by its fast response and over 1 million cycle capability. Without the fast response system, there would be a voltage drop proportional to demand intensity and this would result in a voltage variation on Eigg’s microgrid that could trigger client systems shutdowns. The fast response systems can alleviate this by providing the power during the first seconds. The flywheels and ultracapacitors of Eigg work together in ensuring that all the peaks and troughs can be taken care of before the batteries start discharging. “We are delighted to be working with Kinetic Traction and Skeleton Technologies to implement graphene-based ultra-capacitor energy storage onto our advanced microgrid. We have been using the flywheel technology to support small dips in our power grid for many years already and the addition of ultra-capacitors is another improvement that will prolong the life of our batteries and increase the speed of response of the electricity grid during disturbances.” Stated Mr. Robert Wallace, Official Representative at Eigg Electric. "We have been able to showcase the performance of the flywheel and ultra-capacitors on the Isle of Eigg micro-grid, we believe this combination of flywheel and ultra-capacitor in a frequency regulation application is truly a world first! We have been working closely with Eigg Electric since the flywheel was successfully installed in 2014. The island offers a unique opportunity to showcase new technology because of the high penetration of renewable energy and remote location with no grid connection. The microgrid is known worldwide for having a diverse mix of renewable energy (Hydro, Wind, Solar) and the addition of fast responding ultracapacitors and flywheels makes it the most advanced Islanded Microgrid in the world. We are exceptionally pleased that we were able to successfully complete this project and would like to thank the Islanders and Eigg Electric for their vision and support making it happen." Commented Andrew Goodwin, Chief Technical Officer – Kinetic Traction.